There are a number of long distance walking routes, trails and ways in the Cotswolds Area of Outstanding Natural Beauty that can be walked in their entirety, as part of a walking holiday or in sections. The Cotswolds AONB boasts two National Trails – the Cotswold Way and the start of the Thames Path as well as a network of long distance paths catering to all kinds of walkers. The paths cross some of the area’s finest landscapes and historic landmarks, making it easy for people to explore and enjoy the countryside. 2018 is the year the Cotswold Voluntary Wardens celebrates their 50th Anniversary. One of the ways of marking this a new long distance guided walk along the Cross Cotswold Pathway. This 86 mile trail from Banbury to Bath passes through little known villages tucked away in quiet countryside. It is less strenuous than the Cotswold Way but is not without its challenges. The Cotswold Way is a long distance walking Trail that runs between the market town of Chipping Campden in the north and the city of Bath in the south. The Trail is 102 miles (164 km) long, and runs for most of its length on the Cotswold escarpment. It passes through many picturesque villages and close to a significant number of historic sites, for example the Roman heritage at Bath, the Neolithic burial chamber at Belas Knap, Sudeley Castle near Winchcombe, Hailes Abbey and many beautiful churches and historic houses. For those looking for a gentler walking experience along the Cotswold Way, a number of short, circular walks are available to download. The National Trail website also provides a good range of fact sheets and other leaflets offering ideas for days out and short breaks along the Cotswold Way . Follow the greatest river in England for 184 miles from its source in the Cotswolds AONB to the sea. Passing through peaceful water meadows, unspoilt rural villages, historical towns and cities, and finally through the heart of London to end at the Thames Barrier in Greenwich. A roughly diamond shaped walk visiting many small villages using quiet footpaths. Imaginative and scenic route through rural Gloucestershire, created by the Ramblers’ North Cotswold Group to celebrate its 60th Jubilee in 1995. The route stretches from Northleach in the south to near Chipping Campden in the north, Guiting Power in the west to near Bourton-on-the-Water in the east. The Gloucestershire Way starts from Chepstow. It crosses the River Severn at Gloucester and climbs the Cotswold escarpment at Crickley. From here it follows a route across the hills to Salperton, Stow-on-the-Wold and Winchcombe, and back to the Severn at Tewkesbury. The Heart of England Way runs the length of the West Midlands region from Cannock Chase AONB in Staffordshire, through rural Warwickshire and then finishing in the Cotswolds AONB at Bourton-on-the-Water. The walk is steeped in history and passes through Chipping Camdpen, Batsford Arboretum, Longborough and Lower Slaughter in the Cotswolds. It also forms part of the E2, one of the European Long Distance Paths that stretches 3,030 miles from Galway to Nice. The Limestone Link is a route of 36 miles joining the limestone of the Cotswolds to that of the Mendip Hills. It is a connecting route between the Cotswold Way at Cold Ashton and the West Mendip Way at Shipham. Between the two, the route passes through the valleys and villages south of Bath. Except for an ascent at each end, the walk is mostly flat and not strenuous. The main Macmillan Way runs from Boston on the Lincolnshire coast to the Dorset coast at Abbotsbury, following much of the oolitic limestone belt across which the Cotswolds lies. It is called the Macmillan Way because all funds raised along the route are donated to the charity Macmillan Cancer Support. Along the Cotswold section of this route is the 86-mile Cross Cotswold Pathway which runs from Banbury to Bath. The Macmillan Way Association has also developed a route between Chipping Campden and Banbury known as The Cotswold Link. This enables walkers to do a ‘Cotswold Round’, going from Banbury to Bath on the Cross Cotswold Pathway, from Bath to Chipping Campden on the Cotswold Way and returning to Banbury on the Cotswold Link. The Monarch’s Way is based on the lengthy route taken by King Charles II during his escape after defeat by Cromwell in the final battle of the Civil War at Worcester in 1651. It takes in Boscobel (the Royal Oak Tree), Stratford-upon-Avon, the Cotswolds, Mendips and the South Coast from Charmouth to Shoreham. There are many historic buildings, features of interest and antiquity, with connections to numerous other long distance routes. The whole route is now 615 miles in length and is the longest inland trail within England. The Way, a traverse of Oxfordshire from the Cotswolds to the Chilterns, links the Heart of England Way with the Thames Path National Trail across the rolling limestone countryside of the Cotswold Hills, passing through Shipton-under-Wychwood, Charlbury and other villages before crossing Otmoor to Studley, north of Oxford. Here it turns to Tetsworth and Pyrton, and crosses the open farmland and woods of the chalk hills of the Chilterns to reach the Thames. The Way also connects to Blenheim Park, a World Heritage Site. This long distance trail is named after the classical style of architecture established by Andre Palladio in 17c Italy. The trail starts at The Old Gaol in the centre of Buckingham. The route passes a number of the finest classical house and estates in “middle England” including Stowe Landscape Gardens, Blenheim and Cirencester Park as it goes through glorious Cotswold countryside in the counties of Oxfordshire, Wiltshire and Gloucestershire. It finally descends down towards Bath with a view of the Palladian Bridge at Prior Park before finishing in the centre of the city at the unique “housed” Pulteney Bridge. The Sabrina Way, named after the Roman goddess of the River Severn, and opened by the Princess Royal in 2002, is one of a growing number of strategic long distance riding routes devised by the British Horse Society and Ride-UK. It links with the Claude Duval Bridle Route in Great Barrington, and heads west for approximately 28 miles through the Cotswolds AONB to Woolstone, picking the most interesting and attractive riding route to the least hazardous crossing of the River Severn, at Haw Bridge, before turning north to Hartington in Derbyshire, where it links with the Pennine Bridleway. The Way provides a link between the Oxfordshire Way at Bourton-on-the-Water and the Cotswold Way National Trail at Winchcombe. Whereas its sister route, the Windrush Way, takes to the hills, the Warden’s Way winds through the villages of Lower and Upper Slaughter, Naunton and Guiting Power. Linking the Cotswold Way at Winchcombe with the Oxfordshire Way at Bourton-on-the-Water the Windrush Way goes over the hills with only the remains of ‘lost’ medieval villages en route to the River Windrush in Bourton, whereas its sister route, the Warden’s Way, winds through the villages. Note: The Wardens and Windrush Way were designed back in the 1980’s by the Cotswold Voluntary Wardens. 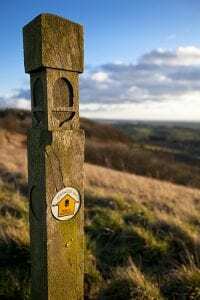 These two 14 mile trails connect the Cotswold Way in Winchcombe and the Oxfordshire Way at Bourton-on-the-Water and form a useful link in the network of long distance paths. The Winchcombe Way is a figure-of-eight trail centred on the town of Winchcombe. The way marked trail is designed to show walkers the hidden gems of the northern Cotswolds. The landscape is constantly changing and reveals the charm of the Cotswolds. The eastern loop climbs out of Winchcombe and follows the Farmcote valley before entering Guiting Wood. From here it passes through quiet valleys and the tranquil villages of Cutsdean, Toddington and Snowshill. The route turns and follows the Cotswold escarpment through the villages of Buckland, Laverton and Stanton nestling at the bottom of the hill. The trail passes the spectacular Stanway House and the recently restored watermill before passing Hailes Abbey on the return to Winchcombe. Originally opened to celebrate the Queen’s Silver Jubilee in 1977 this route links the river Severn and the Cotswolds through the Vale of Evesham, with villages, hills, rivers and, in springtime, plenty of glorious flower displays. The walk originally ended in Winchcombe but has recently been re-routed to Broadway, the launch of the new route is scheduled for Spring 2011 along with a new walkers’ guidebook. The Wysis Way links the rivers Wye, Severn and Thames. The route starts in Monmouth and crosses the Forest of Dean and Severn Vale, then climbs the Cotswold escarpment and continues to Bisley. It drops down into the Frome Valley and leads south to the watershed at Thameshead and the source of the Isis, the highest tributary of the Thames. The WAS Way is Gloucestershire’s newest way-marked trail. It is an ambitious 11 mile circular route that follows public footpaths around the entire town boundary, offering wonderful views across the Stroud Valleys.